File folder holders for anytype of file drawers, metal or wood drawers. Universal File Bars and File Rails. Constructed of of Carbon Steel to Support Your Heavier Filing Loads. 40" long x 1/2" high. Can be custom cut up to 46"
Designed to be used with any type of our file bracket clips. Side : 7/16" 1/2" 3/4"
Heavy Duty Extruded Aluminum 1/8" thick. *We will cut any size up to 42" to your specifications. Heavy Duty Extruded Aluminum 1/8" thick. *We will cut any size up to 42" to your specifications. Can be used with any of our clips. Use with our 5080 Bracket Clips. Designed to fit over a 1/2" standard wood drawer side. 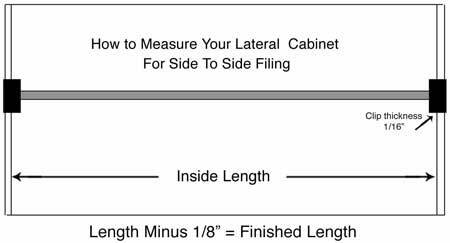 Use with our 1/2" or 3/4" file bar stock for combination legal/letter drawer configurations. B-For Front-to-Back First determine if there is a lip or edge that the clip can attach to. If so, the above instructions apply here also. If not, than you must first create a side-to-side filing bar it now becomes the edge that the front-to-back bar attaches to.